Great picture with cute expression. It seems that you always have high spirits,which make you smile and energetic. These days, I listen to your songs on the performans of the Princess of Tennis and Bleach，they give me happiness and easy moments. I know and I'm sure you're prince in my life. If only I could meet you in my country. 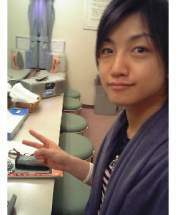 Hmmm... you really seemed to like the peace sign (^^)v Well, looking good as always ♡. Take care yea?